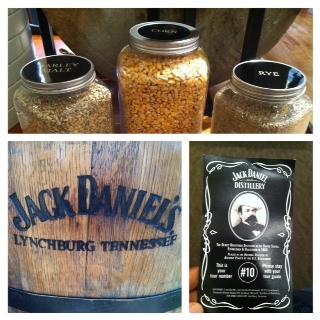 On a recent trip to Nashville, TN, the hubby and I decided to drive a little more than 1 hour over to Lynchburg to take the Jack Daniels Distillery tour. Regular tours are free from 9-4:30. They also have a tasting tour which cost a little extra. There is only a certain number of people that that take that tour and it gets full quickly. We were there at 12 and the 2:30 tasting tour (last for the day) was already full. Since I am not a whiskey fan anyway, it I did not bother me. We signed up to take the regular tour. It was interesting to see the process of creating Jack Daniels. Starting with a few quality ingredients and a unique process that is more than a century old, a delectable liquor is created that is full of flavor. While on the tour I could not take pictures inside the facility of the cooking and brewing process. So I suggest the next time you are close to Lynchburg you should stop and take the tour. But beware! If the smell of liquor will make you drunk, be prepared to get tipsy.